Citi Group doesn’t have much to brag about from a long-term perspective, as it remains 80% off its highs back in 2006. Citi has a good deal to brag about, per the gains it has achieved from its 2009 lows (Up several hundred percent). 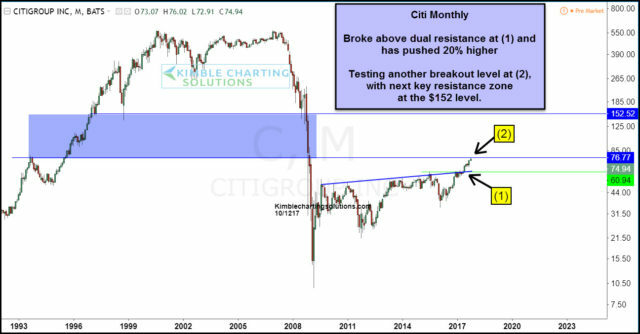 Below looks at Citi over the past 24-years and why the Power of the Pattern feels a critically important resistance test is in play. A few months ago Citi faced a dual resistance test at (1), where enough buyers came forward and a breakout took place. Citi rallied nearly 20% in short order following the breakout at (1). The rally over the past few months, has Citi facing another resistance test at (2), which comes into play at the $77 zone. If Citi can find enough buyers and strength to take out this key resistance zone, it could attract a good deal of buyers as the price of Citi waterfalled in price between the $150 and $77 level. Potential reversal of this waterfall pattern about to take place? We humbly feel what Citi does at current levels will be highly important for it months from now. If Citi can find enough buyers and strength to take out this key resistance zone, it could attract a good deal of buyers as the price of Citi waterfalled in price between the $150 and $77 level. Potential reversal of this waterfall pattern about to take place? We humbly feel what Citi does at current levels will be highly important for it months from now. Full Disclosure- Premium and Sector members have been long this stock for the past few months. What the Power of the Pattern will suggest to do with this holding going forward, will have a ton to do with how Citi handles the key resistance test at current levels. 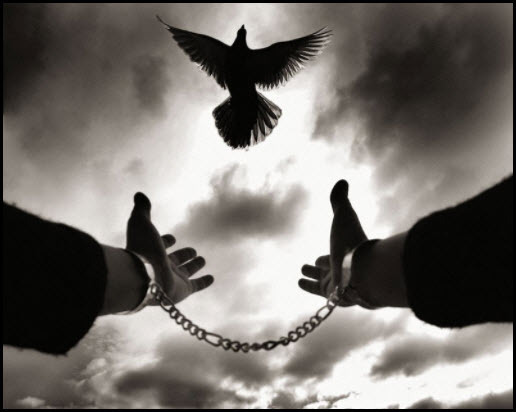 Our plan of action, first step is to bring stops up tightly to protect the gains that we have. If a breakout above the $77 level takes place, will be looking to add to the position and adjust stops.